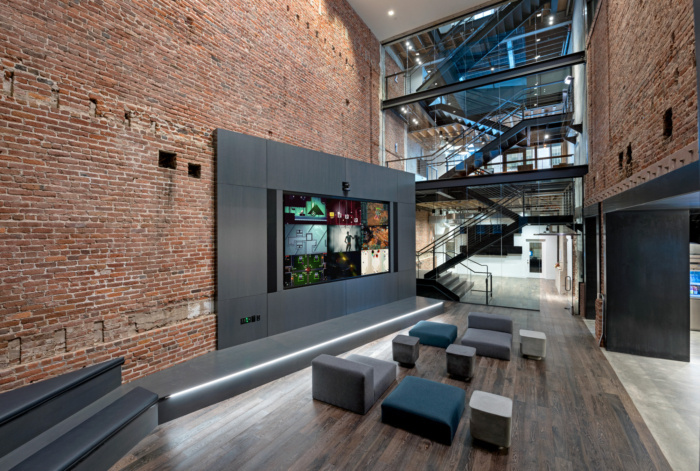 Rapt Studio has utilized a building’s historic character to create the headquarters for Unity, 3D development platform company, located in San Francisco, California. Unity is the creator of the world’s most widely used real-time 3D (RT3D) development platform, giving developers around the world the tools to create rich, interactive 2D, 3D, VR and AR experiences. Unity works every day to democratize development, solve hard problems, and enable success, which is why the office embodies these core principles – with an open framework, built for the next generation of development. Unity reaches 3B devices worldwide and has been downloaded more than 24 billion times – That’s 3x the world’s population with 750 downloads per second! Reflecting the software’s built-in flexibility, Unity’s headquarters was designed across two existing buildings joined into a single complex. Anchored around a three-story atrium, the new office includes areas for screening, assembly, and events alongside dining and workspaces. Employees can attend all-hands meetings from multiple floors, while a neutral interior color palette emphasizes places to collaborate and gather. Inspired by the beauty and authenticity of the buildings’ original materials, we stripped away layers of finishes to expose structural and historic character. Brick walls were left bare and concrete columns were left uncovered. Salvaged wooden beams were transformed into the reception desk and the canteen bar, a space where everyone is welcome to hop behind and pour a coffee or beer. Off the central atrium, an industrial staircase allows open views between rooms and encourages movement between floors. Unity’s platform is known for its agility, which allows quick prototyping and continuous releases. Embracing new technologies and active workflows, the office is as flexible and functional as Unity’s software. Home to executive, marketing and engineering teams, the project caters to diverse work styles: lounges, phone rooms, cafes, conference rooms, and a library. Employees can easily create and integrate data or code around a comfortable, residential-like environment. Unity’s San Francisco headquarters illustrates how anyone can be a creator. Today, the collaborative partnership between Unity and Rapt Studio has continued across a number of global locations, including office projects in Paris, Montreal, Seoul, Copenhagen, and Helsinki. Unity’s San Francisco headquarters has become the creative center of development across the world.